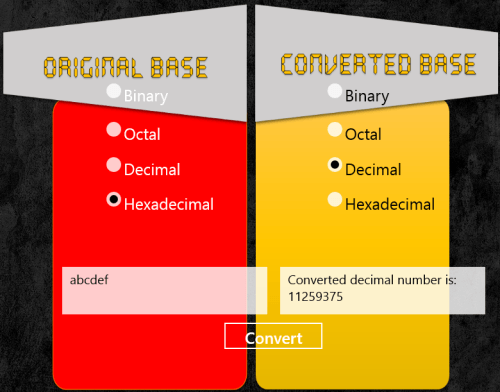 Base Conversion is a simple Windows 8 base converter app that lets you convert numbers in Binary, octal, decimal, or hexadecimal to their equivalents to other bases. 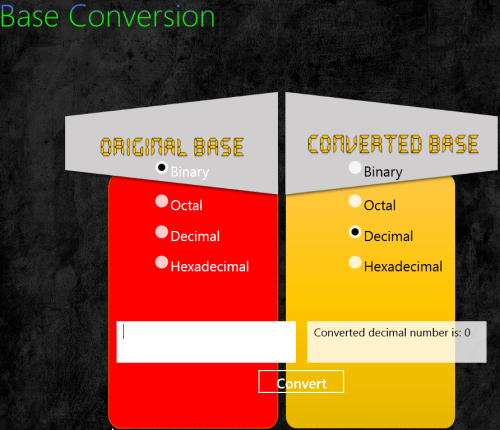 Base Conversion Windows 8 app can be easily located under ‘Tools’ section of Windows Store. On launching this base converter app for Windows 8, you will be provides an interface containing two columns with four radio buttons and a textbox. Select the Original base i.e. the radio button against Binary, Octal, Decimal, or Hexadecimal. Then, type the number to be converted. Next, select the base in the column to the right. Finally, click on ‘Convert’ button at bottom to get result in the second text-box. It shall not have character other than 0 and 1. In case of octal it will be 0 to 7. In case of hexadecimal, nothing else than numbers 0 to 9 and a, b, c, d, e, and f.
* Do note that the app can calculate long numbers as well, but has its own limitation. In case, you entered a long series of numerals then the result will be nothing but a zero. Also, check out our posts on Text Encryption Apps, and Amortization Schedule Calculator. To install Base Conversion Windows 8 base converter app you will require opening this link in any supported web browser like IE 10 or later. Then, on the webpage click on ‘View in Windows Store’ button followed by click on ‘Install’ button in new window. It is only 1.69 MB in size and does not requires any extra permission/access. Base Conversion App is likely to prove helpful to students and developers. In case, you have any such requirement for base conversion then consider giving it a try.